We have decided to branch out the Fantasy Basketball Pros blog in order to write a few entries about an awesome sport that is seeking a comeback. For those avid viewers of Spike TV (and what guy doesn’t love that channel), you may have seen the sport Slamball for two seasons, in 2002 and 2003. Well, Slamball is returning (this time maybe on ESPN or CBS), with eight franchises. If you’re interested, they are holding open tryouts in early April and the season should start in June. 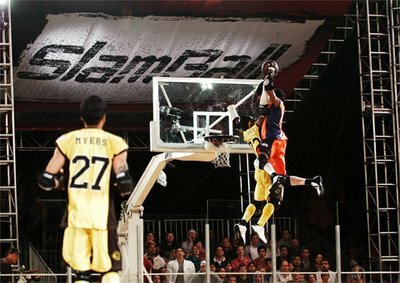 For more information, visit the official website at www.slamball.net. You can also visit Slamball’s official daily journal, written by the Head Coach of the Mob Brendan Kirsch, here. So what exactly is Slamball? Well, it’s an extreme sport and a mix of basketball, volleyball, football, and hockey. It is played 4 on 4 and like basketball outside the 3 point line. But inside the arc, it becomes a slamzone, with trampolines and stoppers that act as goalies to play defense. Basically, you can imagine an NBA point guard being taken out by a monstrous center on his way to the hoop for a slam dunk. 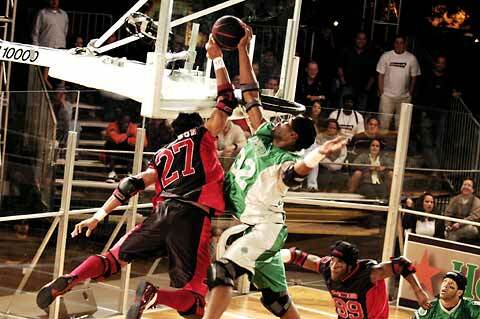 Slamball rewards speed but also a strong physique and toughness, since it is an extreme sport. If you still don’t believe that Slamball is what we would like to be seeing in the NBA, check out this preview video (which also can be found on the website). Not vivid enough for you? Well, just picture a first round Western Conference playoff between the Hornets and Warriors (which is where we stand as of today) where Monta Ellis is going to the hoop for a dunk and Tyson Chandler comes out of nowhere for a ridiculous block. Oh yeah, this is all happening about 20 feet in the air. Not good enough? How about “handler” Steve Nash directing traffic against Bruce Bowen (yeah Suns vs. Spurs first round) and finding the “gunner” Amare Stoudamire flying 25 feet in the air for a monster dunk over Tim Duncan? Also, did I mention that a dunk is worth 3 points in the sport? Imagine Dwight Howard against the Wizards in the playoffs. He must be salivating that the only shot he can really make is now worth that extra point. Hell, why have Hedo shoot from far away when Superman can just slam it home for the same result? So check out the website and if you think you’re man enough, look into applying and going for a tryout. Remember, the season will start in June, which will be conveniently after the NBA Finals so there will be no basketball for several months. Then it’ll be Slamball time. If you’re really interested in Slamball, keep it locked here on FBP because next Monday we will have an exclusive interview with Slamball’s Commissioner Pat Croce–former President of the Philadelphia 76ers. It should be nothing less than amazing. Fantasy Basketball Pros is your home for fantasy basketball breaking news and analysis. If you like what you’re reading, please subscribe to our RSS feed.